When JumpSac announced that they were making a hybrid (convertible) carrier, I practically jumped (get it??) out of my seat! 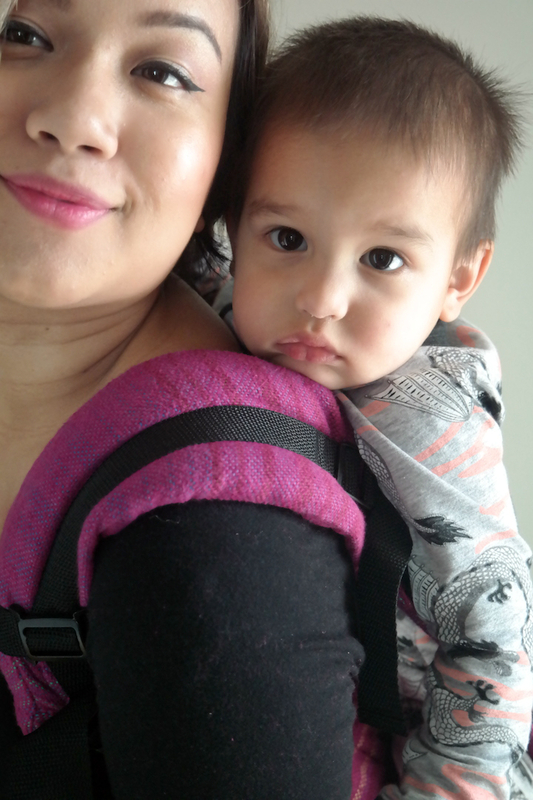 While I wish this newborn-to-toddler convertible carrier had existed when Adam was a newborn, I'm still glad I've had an opportunity to try it on him now as a toddler. 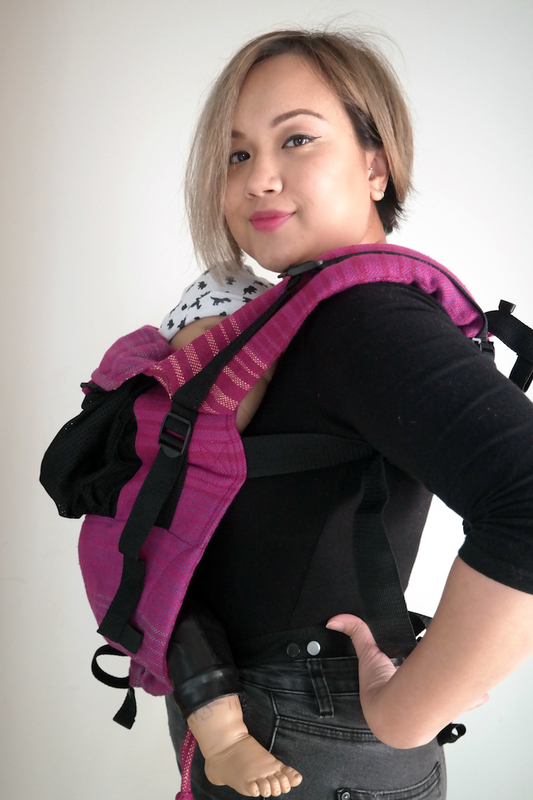 And thanks to my trusty babywearing doll, I even got to try my Flux Carrier in newborn mode, haha. 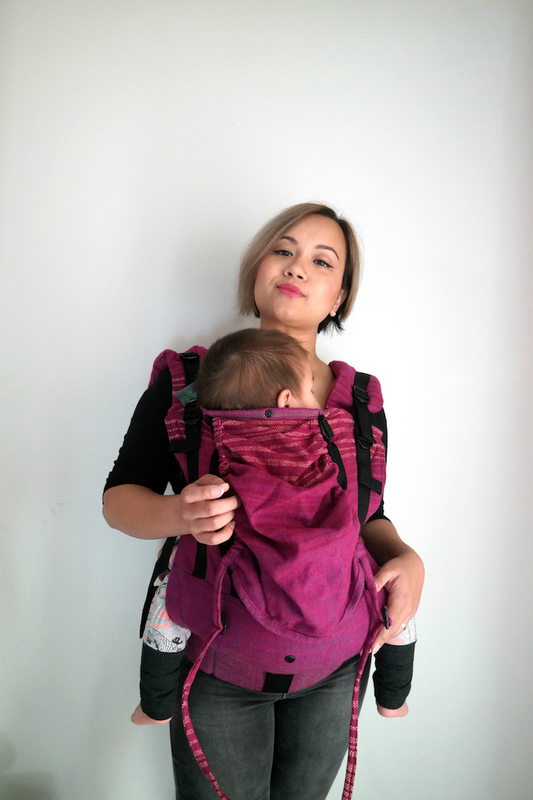 The most frequently asked question I get asked at sling meets and online is: is there a carrier I can use from birth onwards? The answer always is: there are a few carriers you can use - with and without infant adaptors/inserts - but you're going to have to look into each of them and preferably try them out, to be able to find what works for you. 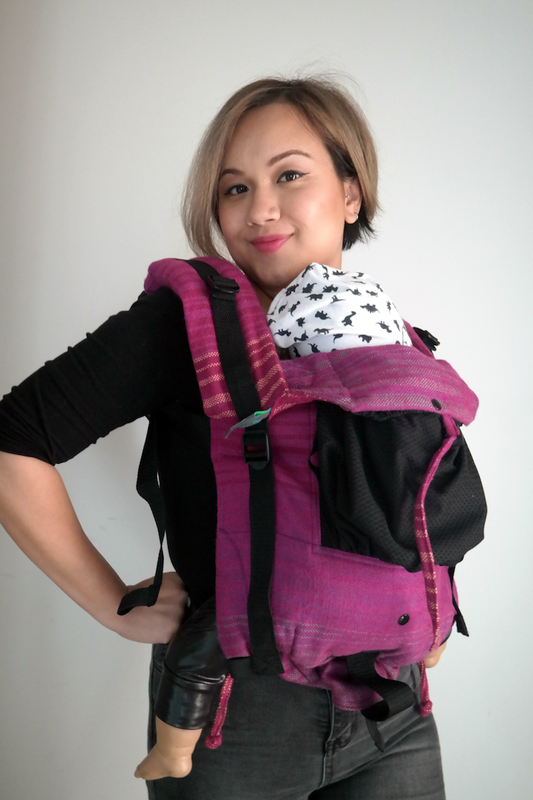 The list is long, sure, but if you're searching for only one carrier to last all your babywearing years, it's worth your while to look at all the options on that list! JumpSac's latest offering - the Flux Carrier - is a more recent addition to said list. 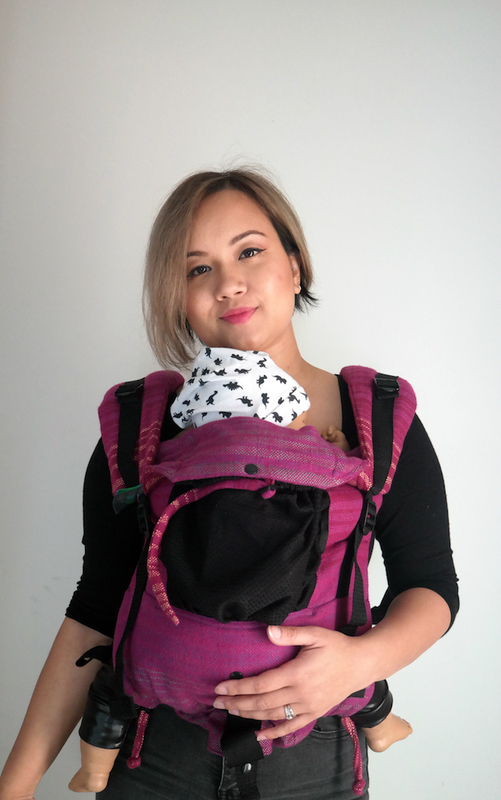 Without the need of an infant insert, this cleverly constructed buckle carrier can be used from newborn age onwards as both a Soft Structured Carrier (SSC) and a Buckle Onbuhimo! 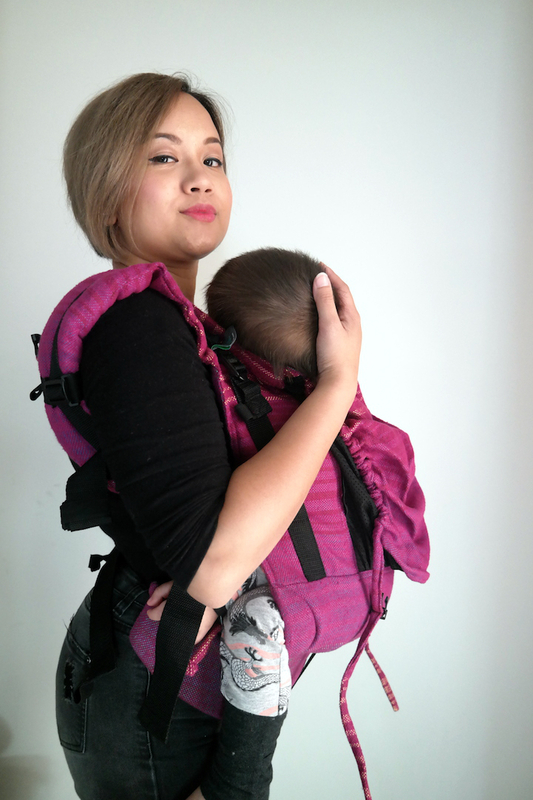 The Flux carrier I tested is a wrap conversion, made from JumpSac's own Solace Merlot wrap (which I happened to review HERE!). I've linked the instructional videos for each mode as well, and they are must-watch! They definitely made it easier on me when I was trying out the different carrying modes. 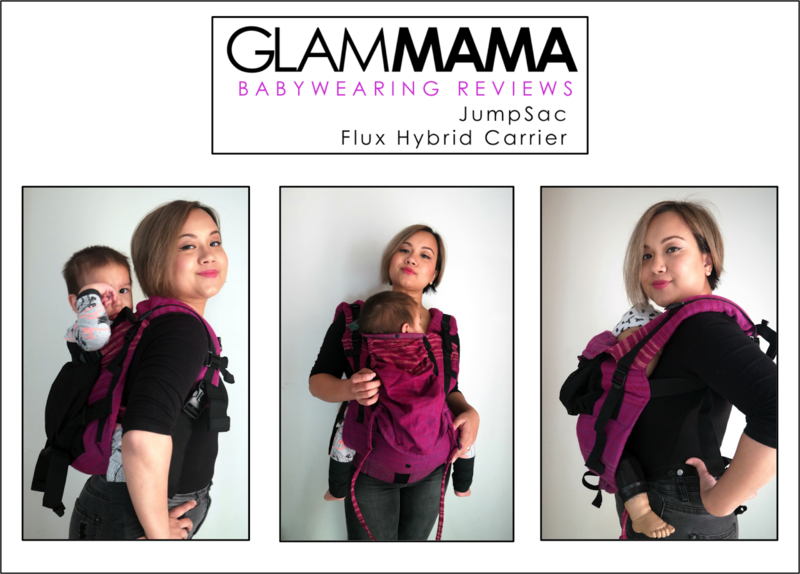 I was actually really excited to try out JumpSac Flux's newborn mode! I've never actually used a buckle carrier with a newborn before (well, I still technically haven't, since I'm using a doll here haha). Please note that there are two ways of wearing the waistband - apron and non-apron. I've used it in non-apron style. The body panel is fully cinched here, so this is the narrowest width. 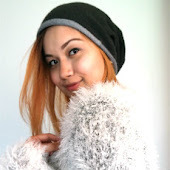 It's also the shortest length, as I cinched it to the smallest setting lengthwise too. 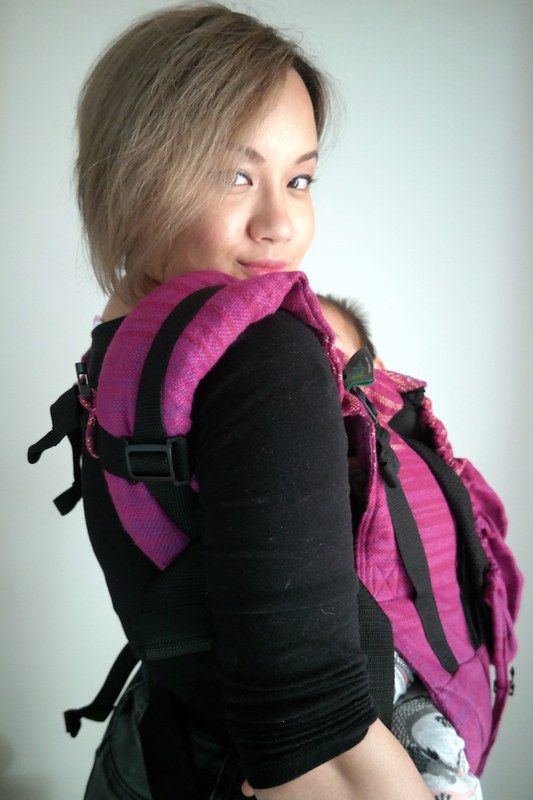 Perfect fit for my weighted babywearing doll (~2.5kg, and about the size of a 3mo old). I could even flip the top of the body panel down so baby's head is visible and kissable. 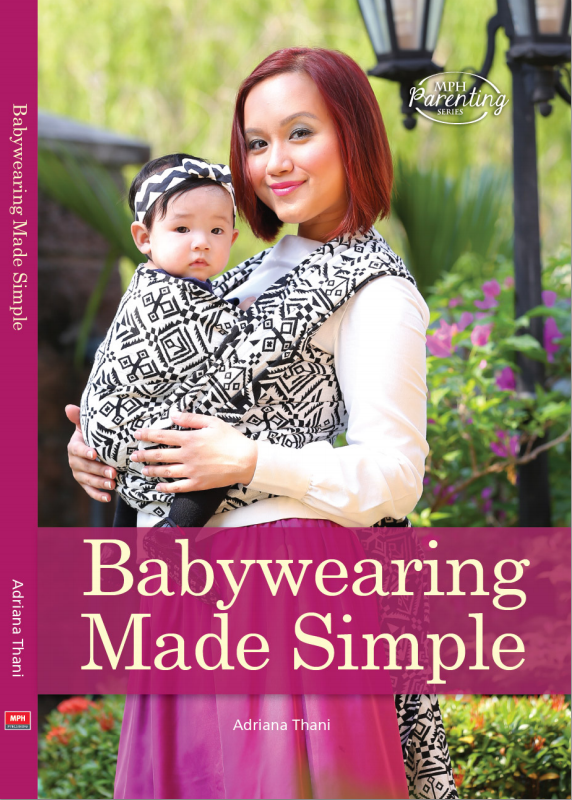 I think this is a great option for parents who prefer buckle carriers to wraps or ring slings for their newborn, but do not want to deal with newborn inserts. Full disclosure: I fail at using buckle onbuhimos! I just cannot get the hang of it, no matter how many adjustments I make. But out of the three buckle onbuhimos I've ever tried, Flux is the most comfortable. I think having such a long body panel helps! The PFAs are not reversed on this prototype (see a close-up of it in the next section), but I have been told that it will be in the finalized design. This is really important when back-carrying in onbuhimo mode! 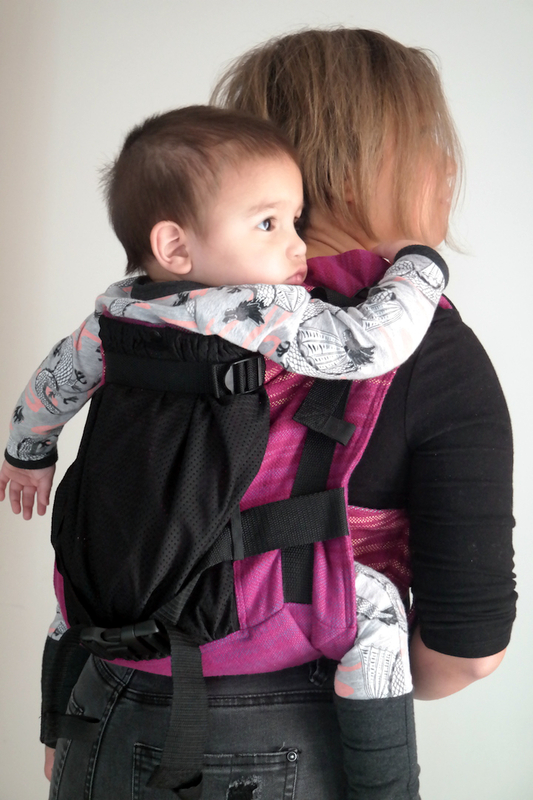 This mode can only be used in a back carry with children who can sit up independently, and wearees should have their arms out over the top of the panel. Buckle onbuhimos have become more and more popular these days, usually because it can be used for high back carries, and also because it is waistless. Waistbands can be really cumbersome, particularly in warmer climates. They can also be uncomfortable when you're seated. 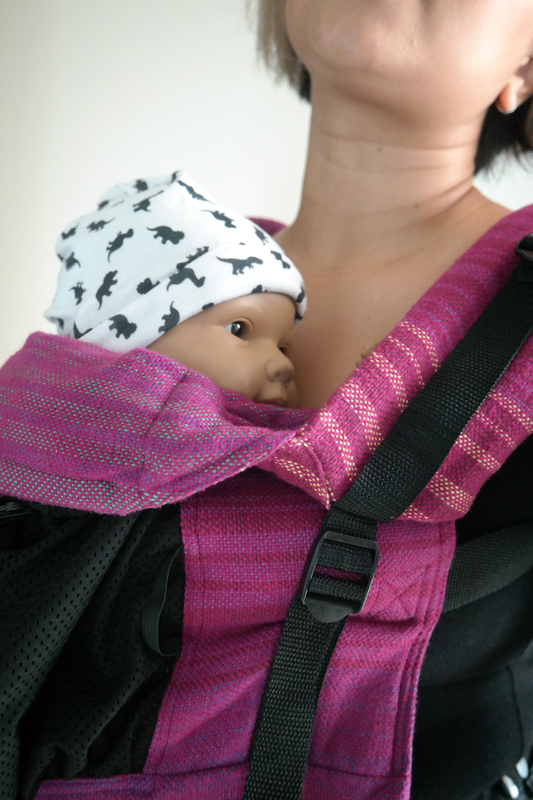 So buckle onbuhimos are a great option as a quick and easy carrier to use, without pesky waistbands! 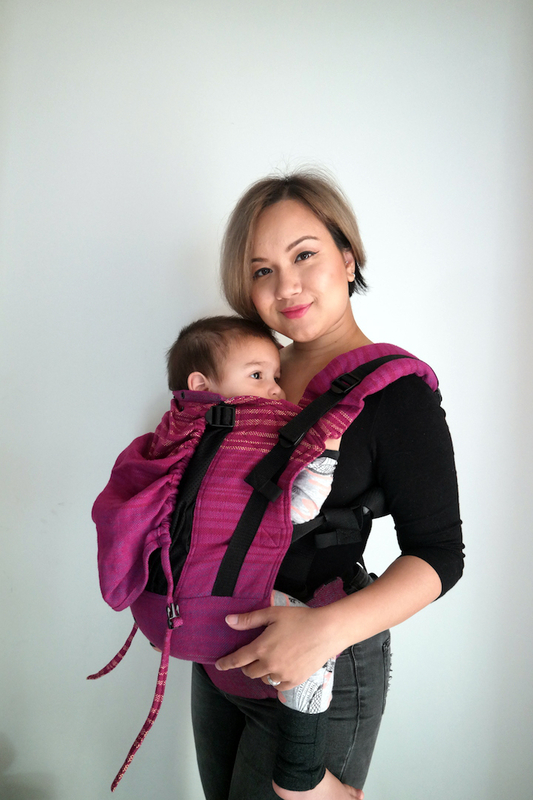 That being said, carrying an older child without a waistband means that your shoulders will be handling most of the weight, so supportive shoulder straps like Flux's are important! 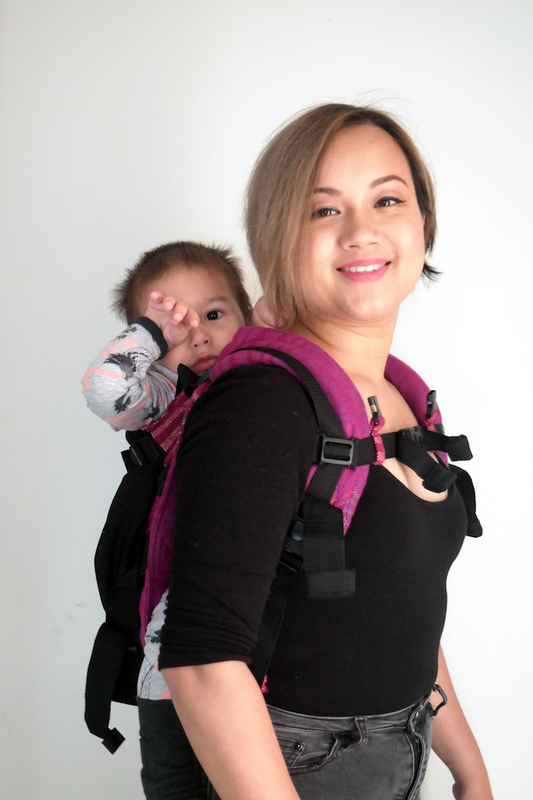 This is my go-to mode with this carrier, and it was very comfortable even in a front carry with my big toddler! As you can see, at its largest setting, the body panel still supports my tall boy knee-to-knee. So this truly is a newborn-to-toddler carrier! In fact, Adam has plenty more room to grow into the Flux height-wise. I fully expect us to be able to use a Flux carrier for at least another year. You can see how thick the padding is in the shoulder straps, but I've been informed that the padding will be a lot less thick in the finalized design of the Flux carrier. And PFA's will be reversed, so they'll be in the opposite direction of the one pictured here. The waistband is on the thicker side, but because it's slightly curved, it does have some contour and moldability. I suspect it'll get more pliable with use. I honestly couldn't have tried the Flux carrier without these videos. They're very very detailed and also describe the different options for each mode. There are all sort of tweaks and tips so it is worth watching these videos if you want to know how to make full use of JumpSac's Flux Carrier. Please note that most of the videos also feature instructions on how to set up JumpSac's Flux Carrier to suit that particular carry mode. Like I said, they're very useful videos! You can check out the in-stock Flux Carrier's on JumpSac's website HERE (there are plenty!!!). Don't forget to LIKE JumpSac's Facebook Page and turn on notifications so you can be updated on any stockings or conversion slots. Also join the JumpSac Chatter Page to see more Flux spam by other testers and parents!